This summer dinner is perfect for a romantic date night for two or a larger dinner party. One serving of sea bass is low in calories and is a perfect way to get your protein and essential omega-3 fatty acids in for the day. Add your favorite sides, and you’ve got a meal your date or friends will be talking about for weeks. 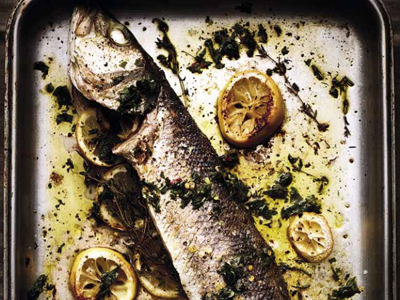 From THE CLEVER GUT DIET COOKBOOK, this is Sea Bass with Seaweed Salsa Verde. Crisp, succulent, and full of flavors of the sea. A delicious way to boost your omega-3s and treat your microbiome to some seaweed. 1. Place a frying pan over medium heat, add the oil, and cook the fillets skin side up for 4-5 minutes. 2. Turn the fillets over and drizzle with half the salsa verde. Cook for 3-4 minutes longer, until the fillets are no longer translucent. Transfer to a plate and pour over the rest of the salsa. 3. Serve with 3-4 small boiled potatoes (ideally reheated so they contain more resistant starch; add 40 calories) and Pea and Edamame Mash. Tip: If using a whole fish, stuff some Seaweed Salsa Verde into the cavity for extra flavor. Make sure to end the night with a delicious cocktail. 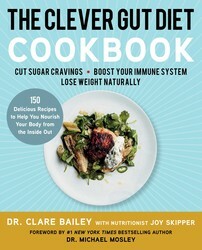 Excerpted from The Clever Gut Diet Cookbook by Clare Bailey. Copyright © 2018 by Clare Bailey. Used by permission of the publisher. All rights reserved. In The Clever Gut Diet, you learned the crucial role your gut plays in your overall wellbeing and in maintaining a healthy weight. Improving your gut health will help you control your cravings, boost your mood, ease intestinal distress, and lose weight. Now, in this eagerly awaited cookbook, you can take this groundbreaking program into your kitchen and enjoy the benefits of a gut-healthy diet at every meal. These delicious recipes for breakfasts, lunches, dinners, snacks, and mouthwatering desserts are proven to help revolutionize your body from the inside out, by increasing the “good” gut bacteria that keep you lean and healthy, while staving off the “bad” gut bacteria that contribute to weight gain and disease. Complete with shopping lists, meal plans, and helpful tips and tricks, this recipe collection will help you transform your gut and your health, one delectable bite at a time.